It's the second, but no less ludicrous, attempt in one week to sway the opinion of the public and President Donald Trump against the concept of denuclearization and peaceful dialogue with North Korea. A March 8, 2019 report from National Public Radio (NPR) follows another by NBC News with sensational and misleading claims that satellite imagery released by private corporations with contractual ties to government defense and intelligence agencies show imminent preparations by the Democratic People's Republic of Korea (DPRK) to engage in missile testing or the launch of a satellite from their facilities in Sanumdong, North Korea. An examination of the photos provided shows absolutely no indication of such activity. 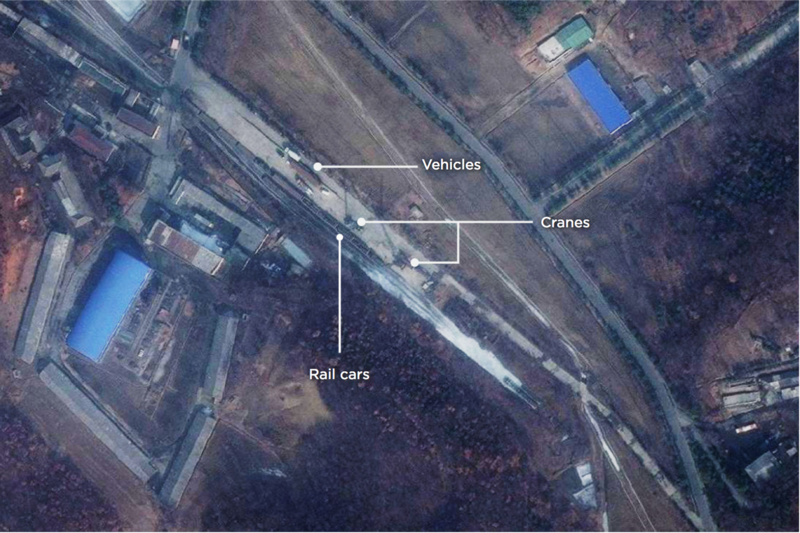 Images provided to NPR by private contractor DigitalGlobe consist of two low resolution images, one of a building in the Sanumdong complex and the other of a train sitting along a rail line. In neither photo is there any discernible amount of unusual activity. 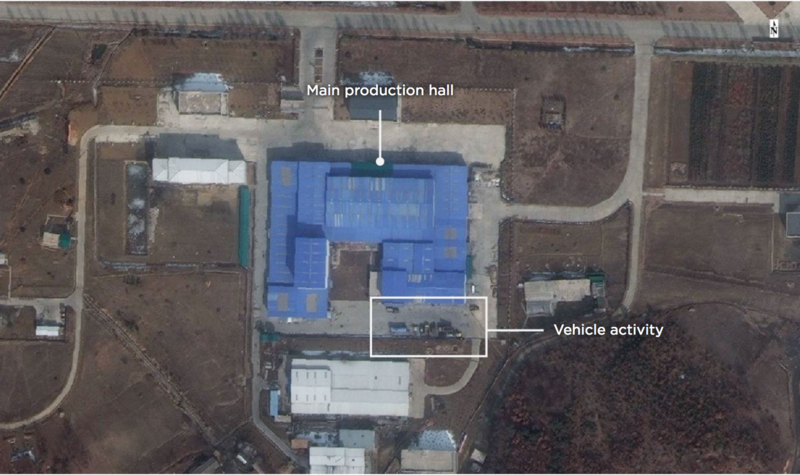 The first image of a "production hall" bears a striking resemblance to a similar photo run by the Washington Post in July 2018 where unnamed intelligence officials claimed that North Korea was building one or possibly two liquid fueled ICBMs which appear to have never materialized or been used in any launch. The claims came one month after President Trump met with Chairman Kim Jong Un in Singapore for a historic summit between the United States and the DPRK. NPR's claims that the imagery shows "vehicle activity" occurring around the facility. Yet close inspection shows that the "activity" consists of a few inert vehicles, which appear to be a white pickup and white dump truck or flatbed parked in a permanent position next to piles of metal. The scene does not appear to be different from any number of sleepy yards of businesses that can be examined by members of the public on Google Maps. The second image, according to NPR, shows rail cars sitting "in a nearby rail yard, where two cranes are also erected." The photo simply shows a train car sitting inert with empty flatbed cars and hopper cars that are either filled with coal or empty. A second rail line similarly holds a number of hoppers and flatbed cars. Hopper cars in particular are totally unsuitable for the transportation of military technology such as missiles. The tracks in the lower left corner are covered in snow, meaning that the train sat for many months through the winter or was backed into its position. Considering that US and international sanctions have caused an extreme scarcity of fuel in the DPRK it is likely that the trains have not moved for quite some time, unless their diesel engines were converted to burn coal or wood. In short, there is absolutely no indication that several low resolution photos of a facility in North Korea have any activity in them outside of a few rusting vehicles that have sat without moving for some time. The report by NPR lists two sources of satellite imagery - DigitalGlobe, Inc. and Planet Labs, Inc. As Disobedient Media has previously reported, DigitalGlobe is an American vendor of satellite imagery founded by a scientist who worked on the US military’s Star Wars ICBM defense program under President Ronald Reagan. DigitalGlobe began its existence in Oakland, CA and was seeded with money from Silicon Valley sources and corporations in North America, Europe and Japan. Headquartered in Westminster CO, DigitalGlobe works extensively with defense and intelligence programs. In 2016, it was revealed that DigitalGlobe was working with CIA chipmaker NVIDIA and Amazon Web Services to create an AI-run satellite surveillance network known as Spacenet. Planet Labs is a private satellite imaging corporation based in San Francisco, CA that allows customers with the money to pay an opportunity to gain access to next generation surveillance capabilities. In February 2016, Federal technology news source Nextgov noted a statement from former CIA Information Operations Center director and senior cyber adviser Sue Gordon that Planet Labs, DigitalGlobe and Google subsidiary Skybox Imaging were all working with the Pentagon's National Geospatial-Intelligence Agency (NGA) to provide location intelligence. Planet Labs' own website also lists press releases detailing past contracts for subscription access to high resolution imagery with the NGA. The pervasive involvement of intelligence agencies and defense contractors in attempts to undermine negotiations with North Korea does not create confidence in the already shaky claims made by NPR regarding alleged preparations by the DPRK to participate in a missile launch. These contentions are not supported in substance by any tangible facts. As claims and pressure continue to build on President Donald Trump to abandon the peace process, there are multiple factions of the United States government who are running a real risk of behaving in manners which could be interpreted as open sedition or refusal to carry out the stated goals and policies of the President.